Turning freshly cut timber, full of sap and the colours looking really bright, is a great pleasure. It gives great opportunities in almost every way. The size you can turn is only limited by your lathe and your lifting capacity. You can combine dramatic natural colour contrasts from dark hard wood through to light sap wood, to a rim of dark bark. And the cost of the wood can be negligible. And all this in one turning operation. For me, one of the greatest benefits is for my health; no more dust in the workshop's atmosphere and no need to wear breathing apparatus or even a face mask. Which altogether makes for a more pleasurable experience. If you haven't tried it, why not give it a go now? You can use these 26 top tips as a starting point to help you on your way. Wherever you live, utilise your local woods. Local woods are someone else's exotic woods! 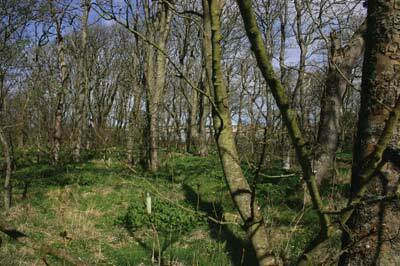 Your local woods are all around you: gardens, parks, roadside etc. Getting your hands on it is not as easy as it used to be, as more people are looking to reduce their heating costs and wood burning is becoming popular, even being considered as environmentally desirable. Even if you have to pay firewood prices, it can be a really good deal. But you have to get in there before it is cut to firewood size in order to be able to get the most out of it. Let people know you are willing to remove wood from gardens, even help out with pruning trees and bushes - yes, don't forget bushes - these can yield some really great wood. Some people will be pleased to know that their wood is going to be made into something nice, and they will therefore probably appreciate a turned piece. Also, get to know local tree surgeons, park keepers and gardeners. I got the wood for this article from a local farmer - Ian Morris - from a fallen beech tree. Keep the logs in the round and in long lengths, and turn them as soon as possible after felling - the same day is good. The uglier the tree, the greater the possibility of you being able to turn something unusual. The piece, as a result, is sure to stand out at an exhibition. 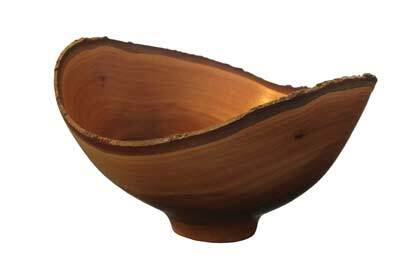 If you are making natural-edged bowls, use timber cut down in the dormant season, as the bark will stay on better. If you encounter any minor problems with the bark loosening whilst you are turning the piece, then simply apply a little Cyanoacrylate adhesive. When planning and marking out your piece on the log, use non-destructive marking on the surface of the bark. 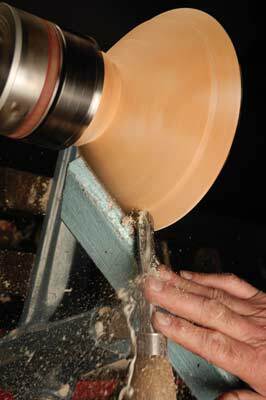 This is important as this is the finished surface of the rim on a natural-edged bowl. For your first project, don't be too adventurous - keep to very simple shapes - straight lines are the easiest to follow. A simple 'V' shape is a good start. You can move on to more interesting shapes once you have mastered the skills. 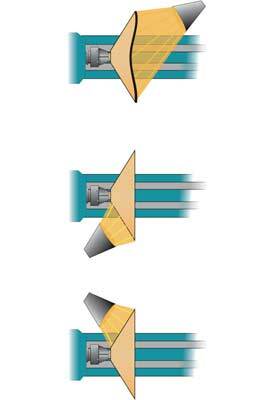 Use just one gouge for your turning. 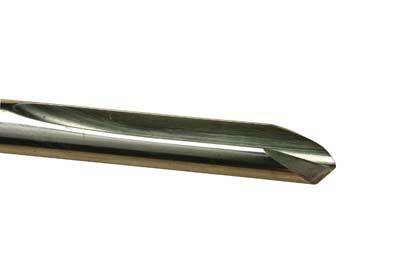 You can even make the spigot with a deep-fluted 12mm (1/2in) gouge with a swept-back O'Donnell grind (as shown opposite). This will give you far more understanding as to how the tools work rather than changing tools for different parts of the project. 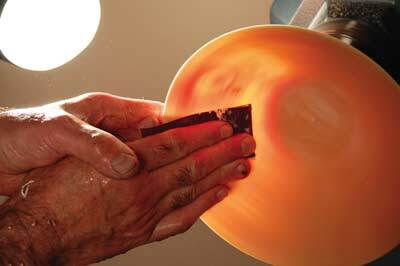 Of course, you will need a big, curved scraper for refining the inside of the vessel you are turning. 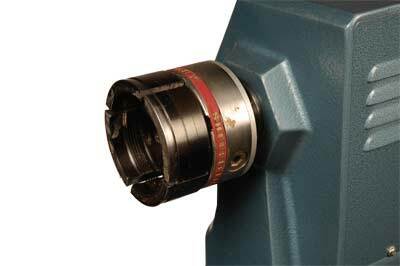 The first holding on the top can be with anything - faceplate, single screw or pin chuck etc. - but for the second holding on the base, use a contracting jaw chuck holding on a spigot. Unless you're turning a large, flat platter this will give you much more freedom of design and much greater access around the base. 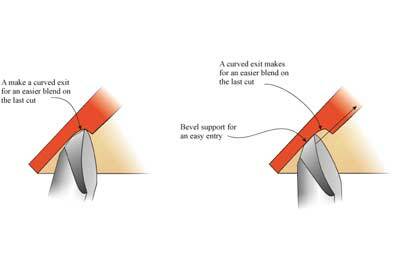 Turning with one hand may look like a party trick but it is an essential skill which allows the 'support hand' to perform essential functions, such as supporting the wood. 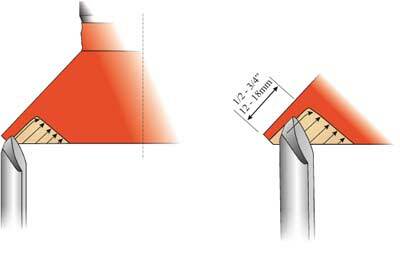 It is worth practising, but this will primarily be applied when using the deep-fluted gouge with a swept-back grind. 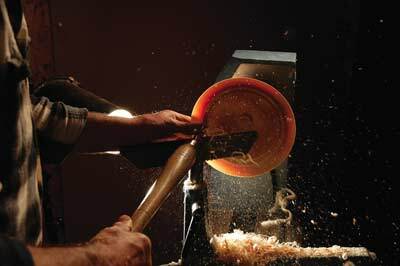 I see many right-handed turners struggling with some cuts, trying to get a smooth surface, and at the same time, covering themselves with wood shavings. Occasionally, try holding the tool in your left hand, e.g. on the outside of a cross-grain bowl. Turning with both hands gives you much more control and flexibility and means that you do not get covered in wood shavings. Make the thickness even all the way round - this will greatly reduce the risk of splitting during the drying process, which should be slow and controlled - particularly with thicker pieces. Sharpen your tools every few minutes, whether the tool needs it or not. It is much better than waiting until a blunt tool has spoiled the surface of your bowl. 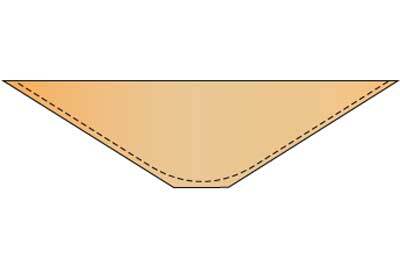 Don't finish the outside in the first operation whilst held on the top of the blank. As you reverse the blank in the lathe and grip in a spigot chuck, the spigot will deform slightly and it will be almost impossible to get the blank running true, and your finishing work will be wasted. 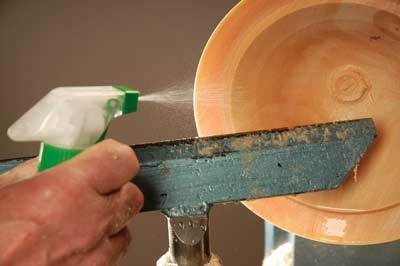 Don't be afraid to cut against the grain on the outside of a cross-grain bowl, from the rim to the base, when held at the base of the piece. With many woods and a good, sharp tool, a pleasing, clean finish can be easily achieved. If there are any grain problems on the outside, then sheer-scrape with the grain, from base to rim. 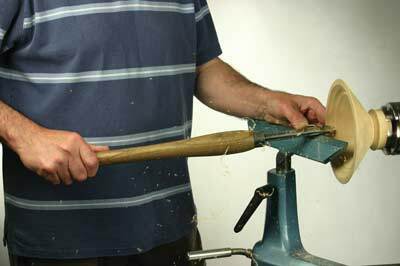 This can be done with the long edge of the deep-fluted gouge, or, alternatively, a skewed scraper. 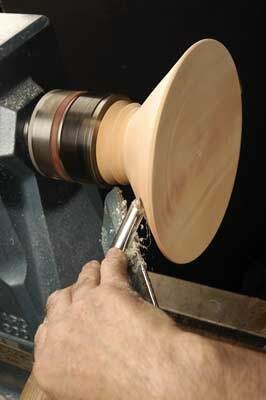 Keeping the wood wet while turning is essential to stop the wood from drying and changing shape. Re-use liquid spray, as this will allow you to wet the wood without wetting everything else in the workshop. 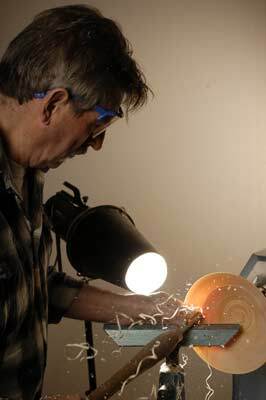 Starting a cut at the rim of a thin bowl can be very difficult - the solution is to start the last cut first while there is plenty of thickness for support. 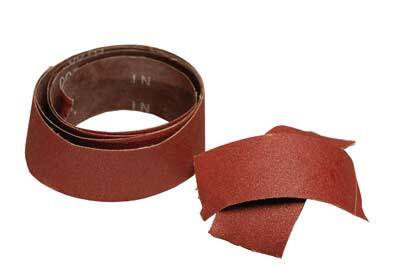 This way, when you come to the last cut, you have some support before contact with the cut begins. As the wood gets thin, it will easily deform under the pressure from the tool. To avoid this, use your fingertips to support it from behind the bevel. The water will help keep your fingers cool and will also provide the required lubrication. Wet sanding is one of the great pleasures of turning green wood. Use a bucket of water; it is quicker and easier for wetting and cleaning the abrasive. Use warm winter in the winter, but when hot, add a few ice cubes. Use a waterproof abrasive to avoid the grit being shed and embedded in the wood. 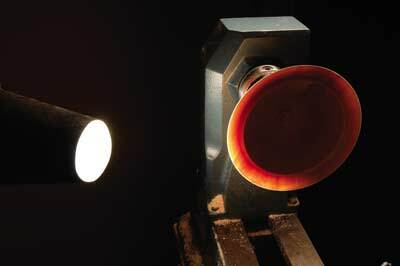 Use localised lighting close to the bowl - this will enable you to see the thickness - so that it does not spill over and cause distraction to the eye. I find the snoot on a photographic light ideal for the job. To do this, firstly, locate the lamp to suit what is being cut; solid - on the outside; NE/intermittent - then shine the light on the rim. Turn with the main lights switched off. The light from a point source light shining through the wood creates an exciting atmosphere. Work with batch production. Have half a dozen or so bowls at a time, and complete all the outsides followed by the insides. This method is quicker, easier, and you will learn much faster. Treating the wood as precious will increase your chances of making a mistake - don't do it. Instead, work confidently and positively and you will reach your goal more quickly and easily. Tip 26: How thin can you go? Turn some bowls to destruction - this will show you how thin you can turn. 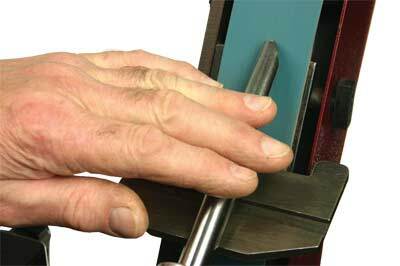 When you can turn down to 2mm thickness, then you will find 5mm is very, very easy. Got the urge to try? If so, then there is a great book that will help you develop further. Turning Green Wood is published by GMC Publications and written by myself.